Hot pink looks great on you. This is totally one of my favorite looks of yours to date! You look stunning. The accessories you chose could not be better. Pinning! Love this dress! The color is gorgeous! And super jealous you were in NOLA this weekend. One of my very favorite places! You are so rocking this lovely dress.....the color and shape are stunning on you!!! Love this dress on you, the color is so flattering with your blond hair and complexion. I also love the shoes!! They are fabulous, I was looking into the flats version. NIkki, you look beautiful as always and love the dress. Also noticed that you got your Valentino inspired shoes via eBay. Do you remember the seller? I have been dying for a similar pair without braking the bank. You look beautiful in fuchsia. Simply striking! Your shoes are girly and pretty. This is a real cheery and fun look! 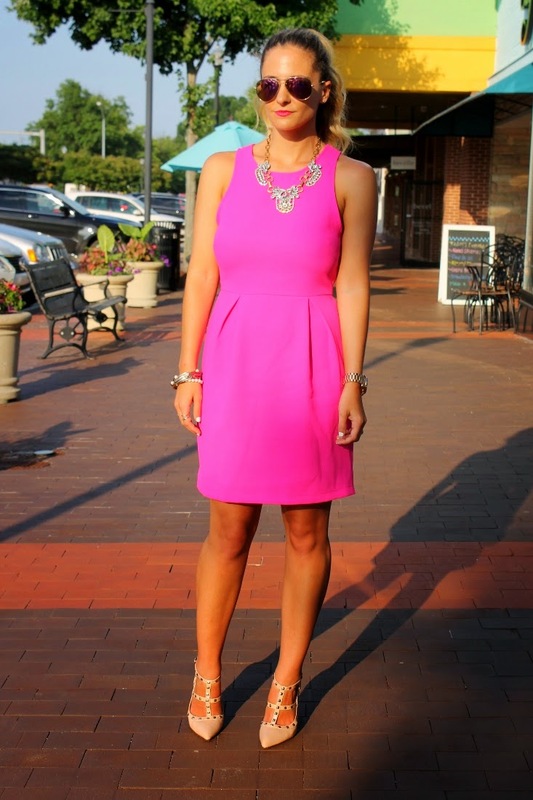 You look great in the is color and the shape of this dress is great on you! I'm glad you had a great trip! You are too hot in this outfit ! Would give my skin to be your shoes !!! !